Getting There: Depending on your U.S. Departing City, airlines to Lisbon, Portugal include Delta, Continental, TWA, Air France, British Airways, and Iberia Lineas. Most flights require a transfer from another European city. The 1-800 phone numbers to these airlines and flight-finding Web links are listed in High on Adventures Travel Info section. Rent a car in Lisbon to complete your trip (e.g., Auto Europe, Europe-By-Car, Hertz). The 1-800 phone numbers and Web links for car rental agencies are listed in this magazines Autos pages. From Lisbon, get on the E1 (E 90) autoroute and drive south, connecting to IP 8, which travels southwest toward Sines, take N 120 along the coast into Lagos and then west on N 125 to Salema. Lagos is the nearest train station to Salema. Trains and buses from Lisbon to Lagos take about 5 hours, where you can catch a bus (EVA) for the 25-mile ride to Salema. If you are traveling from Spain, Salema is about a 3-hour drive from Seville. There are high-speed trains (called the AVE) that link Madrid to Seville, where you can rent a car and drive to the Algarve. From Seville, the autoroute is an easy drive. Take A 49 west to Huelva; bypass Huelva on N 431, cross the Portuguese border and meet up with E1 that connects to N 125. Use a good Spain/Portual road map such as the one referenced above. Staying There: Finding a room in Salema is fairly easy and inexpensive since many houses have rooms (quartos) to rent. Just walk down to the fishing dock, turn left up the main street in town and you will see signs in the windows. Those with rooms to rent will often find you first. You can find recommendations for some lodging choices in Rick Steves Spain and Portugal, a good reference for the region. Fast Facts: The Algarve region with its vast open beaches and coves has long summers, short winters and a mild climate. It is rich in history; and from the 15th century onward, has been the cradle for discoveries. Vasco da Gama, Henry the Navigator, Columbus and Nelson set sail from Sagres or Cape St. Vincent. Seafood is rich here, especially locally caught clams, swordfish, sea bass, and tuna. Good Portuguese wines are abundant and cheap. A variety of leisure activities is available: from golf, tennis, hiking, game fishing, sailing, diving, surfing and sunning. 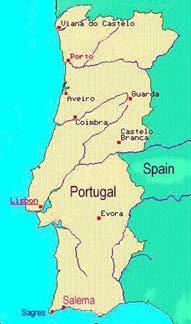 The unit of currency is the Portuguese Escudo (PTE) and as of October, 1997, one U.S. dollar could buy about 179 PTEs. (Perhaps it's a good sign that there is minimal direct Web information on little Salema. A recommended resort city is Lagos). Algarve Web: a variety of rentals, sports, sightseeing, etc.